aFe 18-11103 Round Racing Air Filter , Avi Depot=Much More Value For Your Money! These aFe Pro 5R washable/reusable cotton air filters are made from high-quality materials to ensure a tight seal without gaskets or sealants. They're available in a variety of shapes and sizes and outflow any other filter on the market. 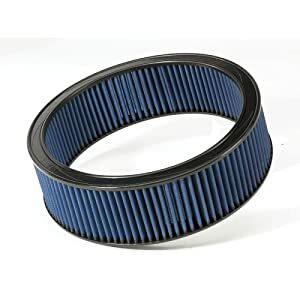 Since air moving in a straight line flows faster, these filters can actually improve airflow and fuel economy.